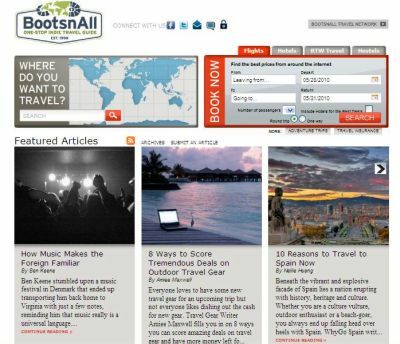 What Do You Think Of The New BootsnAll Design? If you’ve visited BootsnAll during the last week or so, you’ve probably noticed their site went through a pretty dramatic re-design. Why, I wonder? Recent break-up, perhaps, with GoNomad? The web-equivalent of getting a new haircut and going out and buying a new wardrobe? Maybe it was just time for a 2.0 update, with larger graphics, more social networking, and an emphasis on stories. All good changes. The most notable change is that it looks like they went ahead and got a new logo, ditching the somewhat wordy, brown-and-black old logo for a snappier, more colorful design. Something about the new logo makes me think: Sporting Goods Store, for some reason, but I think it looks great and is a huge improvement. What about the “Est. 1998,” does this make anyone else feel a little old? Normally “Est.” dates are some far-back, unimaginably old date, not a year that I could both drive and legally serve in the Army. Most striking is BootsnAll’s elevation of their articles front and center. If you remember, before you had to go and do a little searching down the page to find the articles, and even then they sometimes felt like an afterthought. I like that they’re now giving the pieces the attention they deserve. Though, I kind of wish they’d include a little more information about each piece before clicking through to the full article. When was it posted? How many comments has it gotten? Retweets? I’m sure each article’s great, but online readers today demand peer feedback about what they’re reading. They’ve obviously upped the photo quality with the re-boot of the site. Gone are the days of small thumbnails. Large, colorful photos are the new norm, with what seems like the result of a subscription to a stock-photo database. They’ve also put a new emphasis on their searchable map and booking agent, sticking them right at the top above the articles. Overall, great design redux, with changes and tweaks I’m sure are to come. Made me start to think about our very own logo redo. Any graphic designers out there looking to do a little pro bono work? E-mail me.